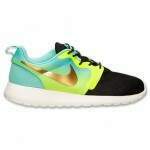 The Roshe Run you've known for years gets some hyperfuse love to create an all new model you'll clamor for. The Nike Roshe Run Hyperfuse Premium Casual Shoes have the same look as the original Roshes, with an advanced, seamless upper that offers total comfort and performance for everyday wear. Lightweight mesh, textile and premium suede are bonded together with advanced Hyperfuse construction, forming an upper that's not only light and breathable, but also durable enough to handle day after day of wear. A full-length Phylon midsole works with a Solarsoft sockliner to offer unmatched comfort, while the waffle patterned outsole ensures traction as you head out on your next adventure. Simple, fresh and low-key, the all new Roshe Run Hyperfuse Premium updates a much-loved silhouette with the latest in Nike technology.